Shut down your Virtuoso instance as normal. Right-click on the existing Virtuoso.app (exact name may vary), and select Show Package Contents. Drill down to Contents --> virtuoso --> database. Check the size of the virtuoso.trx file, found in the database folder alongside the virtuoso.db and virtuoso.ini files. If zero bytes, proceed to step 6. Make a backup of your existing Virtuoso Database and Configuration files (defaults are virtuoso.db and virtuoso.ini) prior to performing the steps that follow. You can simply Option-drag (to force a copy) your virtuoso.db and virtuoso.ini files to your Desktop, Documents folder, or other preferred location. Note: Virtuoso's online backup feature, if enabled, should have already generated a backup-set. 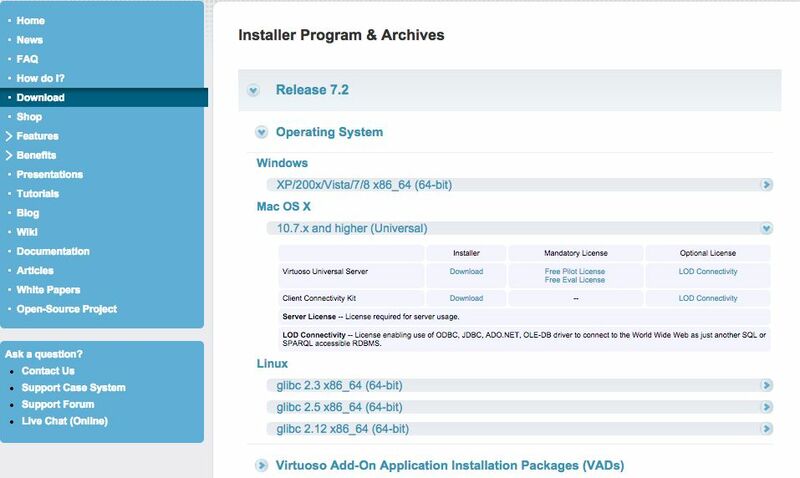 Download the Virtuoso 7.2 installer archive (mwvpz2zz.dmg) from the download site. 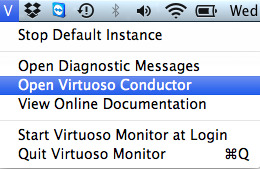 Note: Virtuoso 7.x requires OS X Lion (10.7) or later. 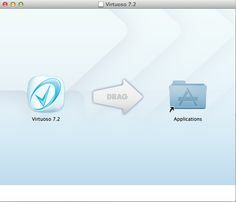 Open the mwvpz2zz.dmg file, and drag the Virtuoso 7.2.app into your Applications folder or other preferred location. Once the copy is complete, you can Eject the Virtuoso 7.2 disk, and discard or retain the mwvpz2zz.dmg file as you prefer. If you haven't already obtained a suitable Virtuoso 7.x license file, return to the download site, and click the link for Free Eval License (15 day duration, requires only your email address) or Free Pilot License (30 day duration, requires some additional personal and business information). Fill out the relevant form, and download the license file when presented. Note -- the file must be named virtuoso.lic for use. Some browsers may rename the file during download; you can simply rename the file on your Mac. Double-click the Virtuoso 7.2.app to trigger installation and startup of helper tools -- the Virtuoso Monitor and OpenLink License Manager. Locate the Virtuoso Monitor in your menu bar -- it's the V icon toward the right. 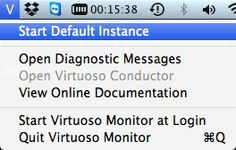 You may also choose to automatically Start Virtuoso Monitor at Login, or you may prefer to manually start it when needed (by double-clicking Virtuoso 7.2.app, as you just did). Drag the license file (virtuoso.lic) you downloaded above into this folder. You may receive a prompt, Modifying "Licenses" requires an administrator name and password. If so, click the Authenticate button, and input a Mac OS X administrator's username and password. Open the Virtuoso Monitor menu, and select Start Default Instance. Open the Virtuoso Conductor, Virtuoso's HTTP-based administration tool, by selecting Open Virtuoso Conductor from the Virtuoso Monitor menu, or by loading this URL in your Web Browser: http://localhost:8890/conductor . 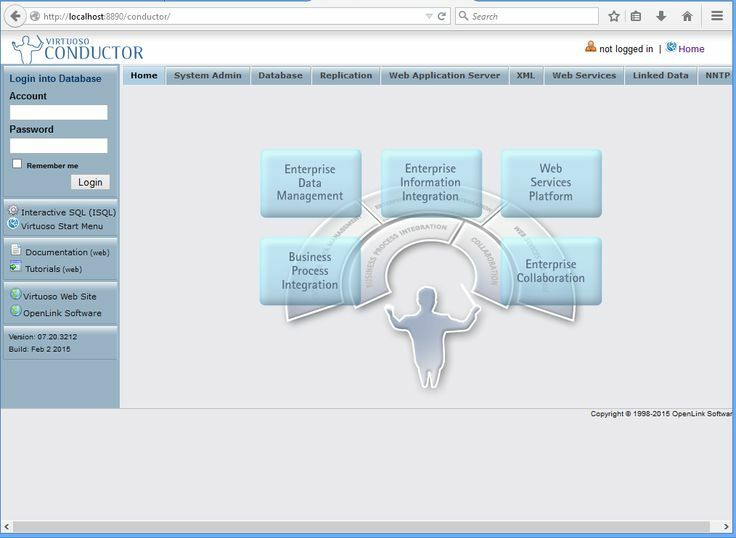 Use the Conductor to configure your Virtuoso instance for future use. For example, it is strongly advised that you change the default passwords for the dba and dav super-user accounts (drill down to System Admin --> User Accounts). If you preserved existing data and configuration files at the start of this process, now is the time to bring them back into play. If you used Virtuoso's online backup feature, the documentation will walk you through the restoration process. If you simply copied the INI and DB files elsewhere, and if they were Virtuoso 7.x files, you can just stop the current Virtuoso instance, and replace the newly created INI and DB with the old ones. For best results, we do advise that you compare the content of the old INI with the new, and add any new settings from the new to the old, adjust as may be appropriate to your deployment. If you simply copied the INI and DB files elsewhere, and if they were Virtuoso 6.x or older files, there are some extra steps that must be taken.